One of the skills that William Ryan has brought to his previous novels is a vivid sense of place embedded to a vibrant historical setting. I still recall being transported to a 1930’s Moscow football match in his novel The Holy Thief and he does the same in his latest. It’s 1917 and the Great War is rumbling on across the English Channel, drawing evermore young men into its maw. Our main protagonist, Captain Robert Donovan is seconded to the British Secret Service. Summoned by his boss, ‘C’, he meets a young code breaker, Kate Cartwright in the anteroom. It’s apparent that Donovan and Cartwright have been called in for the same purpose. Someone has been leaking plans for armaments to the Germans, and there is to be a gathering of the suspects at Blackwater Abbey, the island home of Lord and Lady Highmount. It appears that Lord Highmount is an arms manufacturer and it is his blueprints that have turned up in Berlin. The gathering is for a very specific purpose, to see if they can contact the Highmount’s dead son via a couple of rather dubious mediums, Madame Feda and Count Orlov. Also present will be Kate Cartwright’s parents, who are friends of the Highmounts’ as well as Kate’s erstwhile fiancé, Captain Rolleston Miller-White. The rest of the party is made up of Dr Reid, a shell-shocked soldier, Private Simms and the Highmount’s daughter, Evelyn. Naturally, there are a variety of servants and locals too, adding to the rich mix of characters. 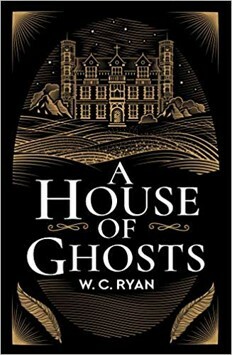 So far, it’s a little And Then There Were None in terms if narrative device; and this is where the author delightfully steps into the gothic, as Kate Cartwright sees the ghosts of the dead, and has perhaps some abilities to see into the future. After the first séance, there is a murder and so the search for a spy also becomes a search for a killer. There is more than a touch of ‘The Golden Age’ about this story and I also got an evocative feel of Howards End and The Remains of the Day from the interactions between the social classes. Kate and Captain Donovan certainly have a nod towards Richard Hannay and Pamela from The Thirty Nine Steps as there’s a Buchanesque quality to the writing. But, be warned, nothing is quite what it seems and this is no pale imitation. William Ryan has given us an elegantly constructed take on a historical spy novel, one that has just the right touch of the gothic.